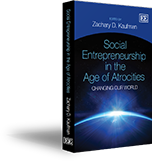 Social Entrepreneurship in the Age of Atrocities, edited by Dr. Zachary D. Kaufman, provides crucial insight into social entrepreneurship from visionaries in the field as well as other experienced practitioners and renowned theorists. While this book focuses on social entrepreneurship as it relates to genocide and other atrocities, the experiences and lessons learned also apply to critical social, economic, legal, and political problems such as healthcare, development, education, and literacy. The authors in this book address the clear need for further examination of social entrepreneurship. They discuss the challenges, obstacles, and opportunities in the field and lend new insight to the concept, history, and methodologies of social entrepreneurship. The book features case studies profiling some of the most innovative and effective social enterprises addressing atrocities, including the National Vision for Sierra Leone, Asylum Access, the Kigali Public Library, Indego Africa, Generation Rwanda, Orphans Against AIDS, Americans for Informed Democracy, and Children of Abraham. Social Entrepreneurship in the Age of Atrocities will inform, instruct, and help build the community of social entrepreneurs. This unique, essential collection of first-hand accounts is an inspiring and informative addition to the evolving social entrepreneurship literature. It will be of particular interest to social entrepreneurs; students, scholars, and practitioners of business, management, public policy, social policy, and development studies; anyone with a philanthropic mindset; and all those who are invested in creating and maintaining a socially responsible, accountable world.